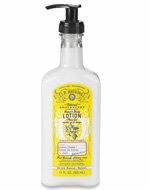 What's In It Wednesday: Another Fabulous Drugstore Lotion! I have always loved the lemony scent from JR Watkins. With the company's apothecary style presentation, one would have thought that they were a natural products company with clean ingredients. Unfortunately, that was not the case. Recently, though, Watkins reformulated their products and the ingredients are phenomenal. The only retail, low-cost lotion I have found to be safe AND feel luxurious is the newly new naturals line from Queen Helene. Until now. Watkins has done a marvelous job at reformulating their body care products and I can recommend them to you without hesitation. Being reviewed is the 95+% natural Lemon Cream Hand and Body Lotion. It is 11 ounces and retails for $11.95 on the Watkins site. I ordered 2 lotions from Enviroproducts World for $5.74 (they were on sale for less than they are now) April 24th which have yet to arrive, so I actually picked up a lemon lotion at Walmart. My other lotions from online have now been shipped, so I'll be happy to talk about the Aloe & Green Tea and Vanilla soon! Let's look into this more! So, what's in it? As you can see, there are no ingredients in bold or green, so there is NOTHING I am worried about in it! Hypericum Perforatum Extract--St. John's Wort, a great skin tonic! Sodium Hydroxide--Lye, as in soapmaking. However, it can also be used as a pH adjuster. Since this is the very last ingredient on the list, it is OK. There was no shea butter, cocoa butter, avocado, babassu, or jojoba in this. While there were some natural extracts thrown in, this was mostly harmful stuff--from the parabens to the Diazolidinyl Urea (which not only is a formaldehyde releaser, but comes from urine and other fluids from the body of animals), to the Triethanolamine (a carcinogen) and Propylene Glycol. I wouldn't have touched this formula with a ten foot pole because of the amount of PG and triethanolamine alone. Bottom Line--I am happy to recommend this! It is extra nourishing with the butters and oils and will really be great this summer if you shave daily and if you just want your skin to glow in general!